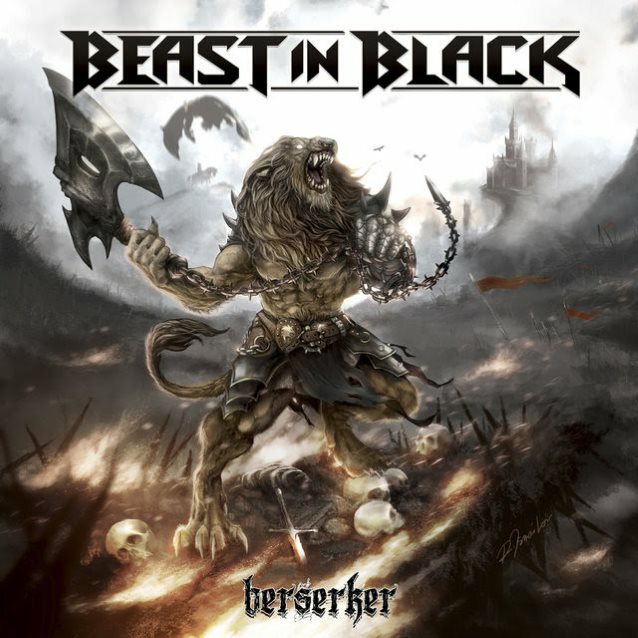 The first trailer for “Berserker”, the debut album from BEAST IN BLACK, the Helsinki, Finland-based metal band led by former BATTLE BEAST guitarist and main songwriter Anton Kabanen, is available below. Due on November 3 via Nuclear Blast, the disc was produced by Kabanen and recorded primarily at his studio, Sound Quest Studio. The cover artwork is a collaboration between Anton and Roman Ismailov, who was the original illustrator and graphic artist for BATTLE BEAST. The official video for the song “Blind And Frozen” can be seen below. The clip was directed by Ville Lipiäinen. BEAST IN BLACK was formed by Kabanen shortly after he exited BATTLE BEAST in early 2015. By the end of that year, his new group had played its first gig as opening act for NIGHTWISH. The recording process for “Berserker” took more than a year and was completed this summer. The Nuclear Blast deal was inked almost immediately after BEAST IN BLACK put the finishing touches on the album. Kabanen was dismissed from BATTLE BEAST in February 2015 due to what was described at the time as “insurmountable disagreements” with the other members of the band. BEAST IN BLACK will support legendary heavy metallers W.A.S.P. on the European leg of their “Re-Idolized: The Crimson Idol 25th Anniversary” tour in late October and all of November.